Turnkey and ready for immediate occupancy! Well-maintained 3-bedroom, 3.5 bathroom has modern touches and is situated at the end of .. This dual residence offers a three-bedroom main house and a one-bedroom apartment in the front of the building. Surrounded by ..
Modern condo and garage with custom finishings and lots of light. A quiet spot close to bike paths. Additions are: .. Recently renovated house and cottage on oversized lot in private, convenient location. House and cottage are well separated making multiple .. Spacious five bedroom three bath home offers multiple options and potential. Convenient mid-island location is ideal for island family or ..
FABULOUS OPPORTUNITY!! EMPLOYERS/INVESTORS OR FAMILY SEEKING YEAR ROUND HOME. Charming one+ bedroom, one bath home on the first floor, with .. Completely remodeled and move-in ready! All new kitchen, new baths, great outdoor space with privacy, fantastic outdoor shower, wood-burning fireplace ..
Centrally located 4 bedroom 2 bath home at the end of a quiet street. Open floor plan, wood floors and ..
‘Into the Mystic’ This beautiful three level, four bedroom, four and a half bathroom home features a warm and inviting .. Wonderful opportunity to rent, renovate and/or expand on this spacious property in the mid-island area. Two existing structures offer use ..
Duplex located in well established mid-island neighborhood close to Nantucket’s South Shore beaches. The main unit is a four bedroom ..
Charming Cape Cod style home sited on a very private lot in a lovely mid-island neighborhood. Turn-key condition with three .. Spacious open concept single family home with sun room on large lot prominently located within the much sought-after neighborhood of .. This custom-built home offers a spacious and bright open floor plan, custom built-ins, Cathedral ceilings, exposed beams and reclaimed oak ..
Rare offering in the Commercial Mid Island business district (CMI), this building offers excellent potential for rental revenue from a .. The opportunity to build your island home, this acre lot lives as a half acre and offers multiple possibilities. Located .. This lovely 2 bedroom, 2.5 bath with full basement condo features an open and bright living/dining area. The condo is ..
Set on 1.78 acres just off of Milestone Road, this four bedroom contemporary home has three floors of finished living .. This recently renovated cottage is newly listed in the Nantucket Covenant Program. Updated appliances, interlocking flooring, and a tucked away .. This well maintained four bedroom, three and a half bathroom home is tucked away at the end of a quiet .. Convenient to shopping, bike paths and shuttle stop, this 2 bedroom, 1 bath ranch is privately set back and has ..
Rare conforming vacant lot with very high visibility in Mid-Island area perfect for many commercial or residential uses including retail .. Extremely well-built unit with three floors of finished living space, a great floor plan and ample parking. Hardwood flooring, tile ..
GAMBREL STYLE HOME – This great new listing on an over sized corner lot in Mid-Island has much to offer! ..
Central location on quiet private way off of Brinda Lane. Main house has 3 bedrooms and 2 full baths. Versatile ..
Set back on the lot this inviting cottage offers privacy and potential for expansion. The open kitchen, living and dining ..
Well-maintained 3 bedroom cape with shop and very large basement. Recent updates include new windows, and roof. The home is .. 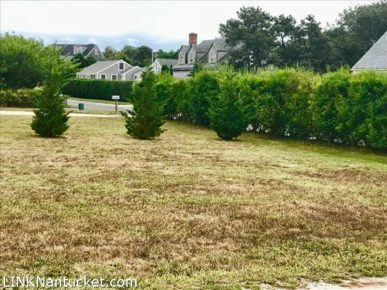 Unique oversized lot in R5 Zoning, located in well established neighborhood, allows for 40% ground cover. Plenty of room for .. Unique, oversized lot in R5 Zoning, located in well-established neighborhood, allows for 40% ground cover. Plenty of room for main ..
TWO FAMILY HOME having a total of 4+ bedrooms, 3 baths, and a full finished basement. Located in a convenient .. This is an adorable one bedroom property in the Nantucket Covenant/Affordable program. The petite house sits on over 4,100 square ..
JUST SOUTH OF TOWN – Classic 3 bedroom, 2 bath Cape Style “Covenant Home” in established year round neighborhood. Large .. This newly created Covenant lot is nicely tucked away off of Greglen Ave. The lot is located in R-10 zoning ..
RARE OPPORTUNITY TO OWN A 30,000 SQ. FT. PARCEL OF LAND ZONED RC-2 IN THE MID ISLAND AREA. Well located ..
NEW PHOTOS! Unoccupied, recently staged, and ready to go! Light and bright three bedroom/2 full bath year-round home with fireplace ..